(by David Shepardson, Reuters) WASHINGTON — The Trump administration on Tuesday imposed restrictions on carry-on electronic devices on non-stop flights coming to the United States from 10 airports…in the Middle East and North Africa in response to unspecified terrorism threats. The new restrictions were prompted by reports that [Islamic terrorist] groups [including ISIS and Al Qaeda] want to smuggle explosive devices in electronic gadgets, officials told reporters on a conference call on Monday. The airports are in Cairo, Egypt; Istanbul, Turkey; Kuwait City, Kuwait; Doha, Qatar; Casablanca, Morocco; Amman, Jordan; Riyadh and Jeddah, Saudi Arabia; and Dubai and Abu Dhabi in United Arab Emirates. …The airports affected by the electronics rules are served by nine airlines that fly directly from those cities to the United States about 50 flights a day, senior government officials said. The policy does not affect any American carriers because none fly directly to the United States from the airports, officials said. The carriers with non-stop flights – Royal Jordanian Airlines, Egypt Air, Turkish Airlines, Saudi Arabian Airlines, Kuwait Airways [KA.UL], Royal Air Maroc, Qatar Airways, Emirates and Etihad Airways – have until Friday to comply with the new policy, which took effect early on Tuesday and will be in place indefinitely. DHS officials did not explain why the restrictions only apply to travelers arriving in the United States and not for those same flights when they leave from there. The rules apply to U.S. citizens traveling on those flights, but not to crew members on those foreign carriers. Homeland Security will allow passengers to use larger approved medical devices. Angela Gittens, director general of airport association ACI World, likened the move to years-long restrictions of liquids on planes, which she said also came suddenly, in response to a perceived threat, and caused some disruption. U.S. officials have told Reuters the information gleaned from a U.S. commando raid in January in Yemen that targeted al Qaeda in the Arabian Peninsula included bombmaking techniques. Al Qaeda in the Arabian Peninsula (AQAP), based in Yemen, has plotted to down U.S. airliners…. The group claimed responsibility for a Dec. 25, 2009, failed attempt by a Nigerian Islamist to down an airliner over Detroit. The device, hidden in the underwear of the man, Umar Farouk Abdulmutallab, failed to detonate. In 2010, security officials in Britain and Dubai intercepted parcel bombs sent from Yemen to the United States. The Homeland Security Department under President Obama stepped up security of U.S.-bound flights in July 2014, requiring tougher screening of mobile phones and other electronic devices and requiring them to be powered up before passengers could board flights to the United States. Q13: How does this affect the American public, either those traveling to/from these selected airports and those flying within the U.S.? A13: All passengers flying through and from these locations will have to place electronic devices that are larger than a cell phone/smart phone in their checked bags regardless of the passenger’s citizenship. Q14: Will the security procedures continue to apply to both international and domestic passengers? A14: This applies to all passengers traveling from 10 specific airports overseas. Q15: Why are you only implementing these measures overseas, could the same tactics be used domestically? 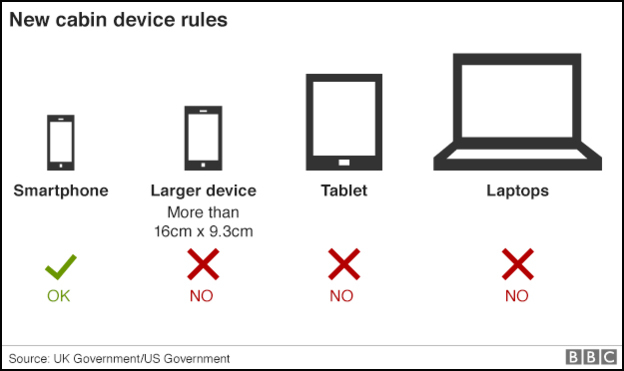 A15: Electronic devices will still be allowed on all flights originating in the United States. Security procedures, both seen and unseen, are in place to mitigate the risk to flights in the United States.